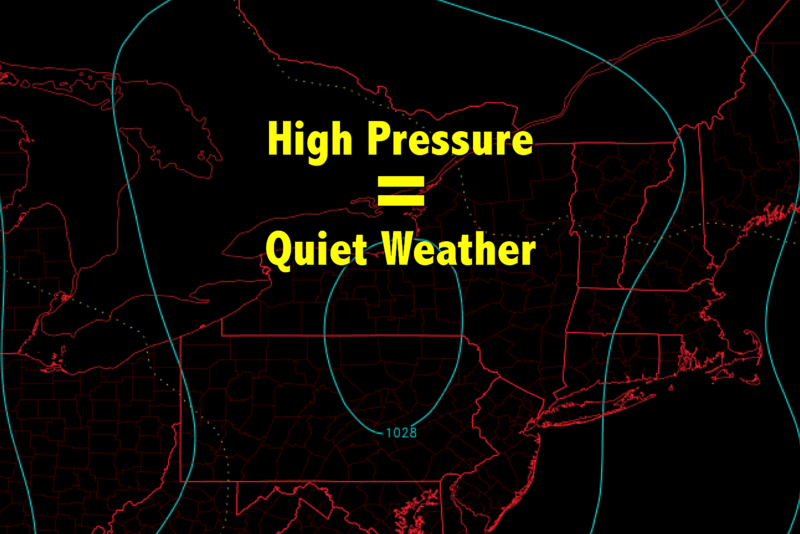 With high pressure firmly in control of New Jersey's atmosphere, our weather will stay remarkably quiet and quite pleasant for the first half of the week. I got nothing. Chilly mornings, sunny afternoons, and substantially dry and pleasant weather. Period. Jackets may be needed Monday morning, as temperatures have fallen into the chilly zone. A few higher-elevation weather stations are showing 30s and patchy frost. Most thermometers in the state are showing 40s. And the Jersey Shore is beginning the new workweek in the 50s. Overhead, nearly perfect blue skies and sunshine should warm temperatures into the lower to mid 70s by Monday afternoon. Light winds and dry weather will make for another spectacular early Fall day. Monday night will be cool, although not quite as cool as the past couple of nights. (That's because of subtly increasing humidity.) Most temps will bottom out in the lower 50s overnight, with mid 50s in the warmer urban areas and 40s in the cool spots. Patchy frost is unlikely, but patchy fog will be possible overnight. Another quiet weather day is expected on Tuesday, featuring mostly sunny skies and high temps again in the lower 70s. On Wednesday, we'll start to warmup a bit. With a mix of sun and clouds and a brisk southwesterly breeze, thermometers should climb into the mid to upper 70s by Wednesday afternoon. Forecast confidence drops as the weekend approaches, with the potential for some more unsettled weather. I think temperatures will remain very warm, perhaps 10 to 15 degrees above normal by the end of the weekend. There will be clouds and a few showers, however, so it won't be the "practically perfect" Fall weather we'll enjoy for the first half of the week. There are no widespread frosts or freezes in the forecast, and no significant storm systems on the horizon. The tropics are quiet for now, but the Atlantic hurricane season continues until November 30. I know there are many who find the recent lack of rain concerning. We have enough of a rainfall surplus to stave off drought concerns for now. Fire danger, however, may be an issue, particularly on breezy days.